In 1975 Annie Dillard took up residence on an island in Puget Sound in a wooded room furnished with "one enormous window, one cat, one spider and one person." For the next two years she asked herself questions about time, reality, sacrifice death, and the will of God. 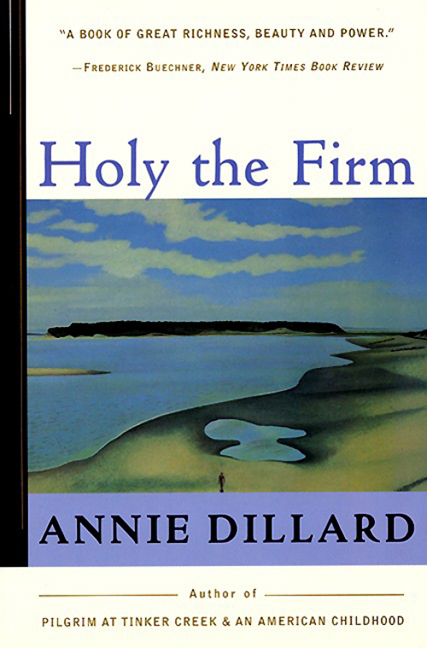 In Holy the Firm she writes about a moth consumed in a candle flame, about a seven-year-old girl burned in an airplane accident, about a baptism on a cold beach. But behind the moving curtain of what she calls "the hard things -- rock mountain and salt sea," she sees, sometimes far off and sometimes as close by as a veil or air, the power play of holy fire. This is a profound book about the natural world -- both its beauty and its cruelty -- the Pulitzer Prize-winning Dillard knows so well.